In blender, place tomatoes, roasted peppers, bread crumbs, almonds, garlic and salt. Cover; blend 60 to 90 seconds or until nearly smooth. Sauce will still have some texture. Reserve. Meanwhile, in 12-inch nonstick skillet, heat 2 teaspoons of the oil over medium-high heat. Season chicken with garlic salt, paprika and pepper. Add chicken to skillet; cover and cook chicken 10 to 12 minutes, turning once, until juice of chicken is no longer pink when centers of thickest pieces are cut (at least 165°F). Remove to plate; cover to keep warm. Add remaining 2 teaspoons oil to same skillet; heat over medium heat. Add zucchini and cook, uncovered, 2 minutes, turning frequently with tongs. Add sauce and chicken to skillet; stir until completely combined. Cook 2 to 3 minutes or until heated through. Top with parsley; serve immediately. Romesco is a tomato-based sauce that originated from Catalonia, Spain. It typically features roasted tomatoes, peppers, garlic and is thickened with nuts and bread crumbs. 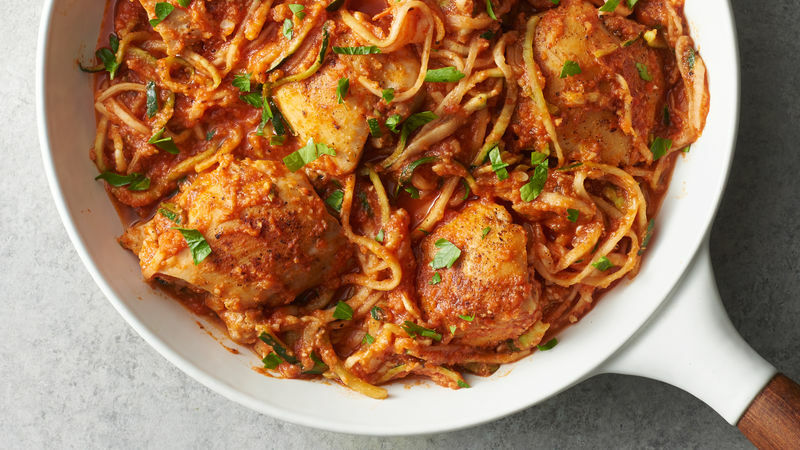 This versatile sauce is great with fish, chicken and vegetables. If you choose to use prespiralized zucchini, measure by the ounce. We used about 16 oz of zucchini spirals in this recipe. Starting with dry zucchini spirals is essential to achieve good results with this recipe. To soak up water, place zucchini spirals in clean kitchen towel, and gently squeeze to remove excess water. Spiralizing your own zucchini typically results in a drier spiral as compared to purchased ones.